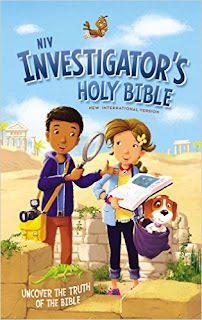 Living a Fit and Full Life: Invite Children to Investigate the Bible with the New NIV Investigator's Holy Bible by Zondervan! Invite Children to Investigate the Bible with the New NIV Investigator's Holy Bible by Zondervan! As a Christian mom of 4 I love this NIV Investigator's Holy Bible by Zondervan! What better way to study the Bible than to investigate it! The NIV Investigator's Holy Bible by Zondervan helps kids understand the Word of God better which I'm all for. Sometimes the Bible can be hard to understand, even as an adult I have a hard time. That's why I think this NIV Investigator's Holy Bible is the perfect gift for kids. Helping kid to understand the Bible is a great way for kids to learn about their ever loving God. One of my favorite feature of this Bible is the Evidence section because it explains what kind of book it is, who wrote it, what happens, and the “best part”. I found this information to be extremely helpful as did my 9 year old. Understanding that info really helps you understand what you're reading much better. The Breakthrough is also really good because it really helps kids dive even deeper into the Bible to really understand it. Another terrific feature is the Detective section because it quizzes students on what they have learned which is a terrific way to help kids retain the information that they have learned. The NIV Investigator's Holy Bible by Zondervan is wonderfully terrific and I highly recommend it! You can find NIV Investigator's Holy Bible by Zondervan on Amazon, Barnes and Noble and other bookstores.